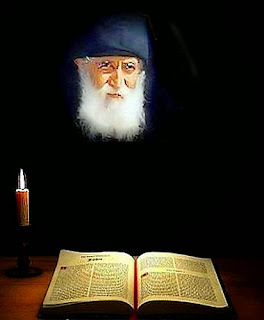 HONEY AND HEMLOCK: Elder Paisios: "Light Reading Does Not Redeem"
Elder, when someone is tired or upset, he usually wants to read something light and easy, a short story or a novel, perhaps, or something like that. Is there no spiritual book that is appropriate for such times? The purpose is not to forget one’s worry, but to be redeemed. Such light reading does not redeem. Novels, newspapers and television have no value in developing a spiritual life. Quite often even some religious periodicals are damaging to Christians, because they stir a foolish zealousness that leads to confusion. Take care. Do not read unnecessary things during your free time. Some reading matter is completely hollow, like a water-pumpkin; it is like looking in a haystack to find a kernel of wheat. Some people say, “Yes, but they relax me.” But how can they be relaxing, my good man, if they make you dizzy and cause your eyes to ache? It is better to rest by sleeping. You can learn much about a person’s spiritual state from what he reads. One who is very worldly will probably be reading indecent magazines. One who is less worldly will read less indecent magazines and newspapers. One who is religious will read religious periodicals, or contemporary religious books or patristic texts, and so on. Source: From "Spiritual Awakening", Vol. II in the Spiritual Counsels of Elder Paisios of Mount Athos series (Souroti, Thessaloniki, Greece: Holy Monastery "Evangelist John the Theologian", 2008), pp. 109-114.